Aberporth - Dolwen & Dyffryn Beaches BeachAberporth, a pretty coastal village, shelters two beautiful sandy beaches named Dolwen and Dyffryn. Low tide comes complete with little rock pools on the sandy beach where children gather for hours of entertainment. Alternatively, the cliff top walks above Aberporth offer extensive views out to sea making it a perfect spot to watch the Bottlenose dolphins that can often be seen close to shore. Orcas and harbour porpoises have been also been spotted whilst Sunfish and basking sharks are offshore visitors in summer. Until the early 20th century, Aberporth was the centre of the bustling herring fishing industry; today there is crab and lobster fishing on a small scale. Dolwen - Seaside Award beach. Toilets, refreshments, shops, parking. Lifeguard service provided 10:00 - 18:00 25 May to 2 June & 15 June to 1 September 2019. Dog restrictions to areas of the beach May to end September (dogs are welcome throughout the year on Dyffryn beach, whilst dogs can visit Dolwen beach from October to April). 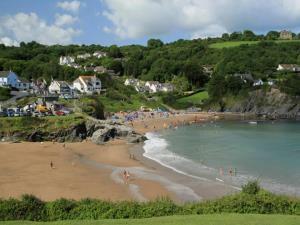 Aberporth, a pretty coastal village, shelters two beautiful sandy beaches named Dolwen and Dyffryn. Low tide comes complete with little rock pools on the sandy beach where children gather for hours of entertainment. Alternatively, the cliff top walks above Aberporth offer extensive views out to sea making it a perfect spot to watch the Bottlenose dolphins that can often be seen close to shore. Orcas and harbour porpoises have been also been spotted whilst Sunfish and basking sharks are offshore visitors in summer. 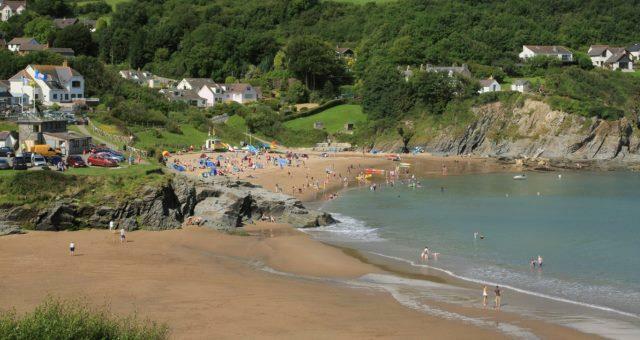 Until the early 20th century, Aberporth was the centre of the bustling herring fishing industry; today there is crab and lobster fishing on a small scale. Turn off the A487 Cardigan to Aberystwyth road at the roundabout near Blaenannarch onto the B4333 for Aberporth.